This document gives descriptions for Photo Set 97-B, which focuses on SLORC’s campaign of village destruction in Papun District (for further details see "Wholesale Destruction: The SLORC / SPDC Campaign to Obliterate All Hill Villages in Papun and Eastern Nyaunglebin Districts", KHRG #98-01, to be released shortly.). Photos #48 and 49 concern the stories of former SLORC soldiers and an escaped porter, also to be documented in an upcoming KHRG report. This document gives descriptions for Photo Set 97-B, which focuses on SLORC’s campaign of village destruction in Papun District (for further details see "Wholesale Destruction: The SLORC / SPDC Campaign to Obliterate All Hill Villages in Papun and Eastern Nyaunglebin Districts", KHRG #98-01, to be released shortly.). Photos #48 and 49 concern the stories of former SLORC soldiers and an escaped porter, also to be documented in an upcoming KHRG report. 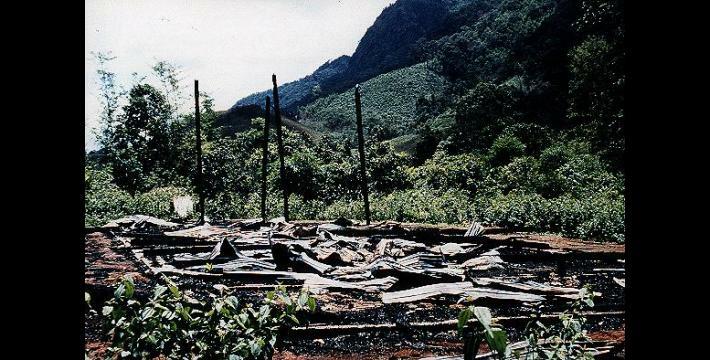 Attached to the end of this report is a copy of KHRG Information Update #97-U3 (originally released on 25/6/97), which gives background on SLORC’s campaign to destroy all villages in the Yunzalin and Bilin River areas of Papun District of northern Karen State. 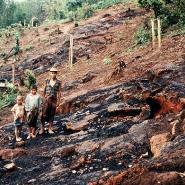 In an apparent attempt to wipe out all possibility of civilian support for opposition forces and to gain military control over this region of remote forested hills and small villages, since February 1997 SLORC troops from at least 6 different Battalions have been going from village to village, burning and destroying everything in their path and shooting villagers on sight. 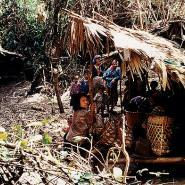 In most of the area they are not even attempting to make contact with the villagers. 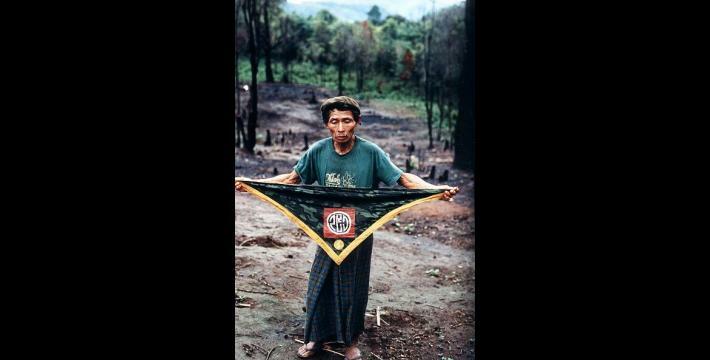 The photos in this list were taken in June 1997, at which time KHRG compiled and confirmed a list of 73 villages which had been completely destroyed (100%, i.e. every house), and 4 more which had been partially destroyed. Over 20 other villages close to SLORC garrisons had been forced to move. 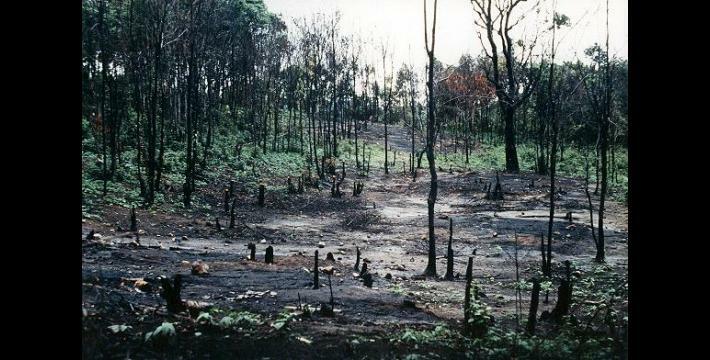 Since that time, people whose villages were burned by SLORC troops in the months leading up to rainy season (which began in June) were hoping for a rainy season respite so that they could continue living in hiding in forest shelters close enough to their fields to grow a crop. 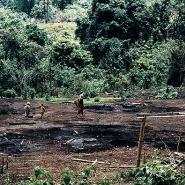 However, SLORC has continued to send out "search and destroy" patrols throughout the rainy season. 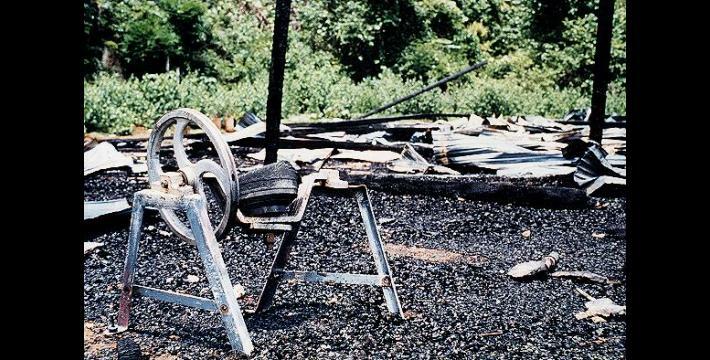 An independent visitor who just returned from the region has updated the list of destroyed villages to 93, and more are still being destroyed. 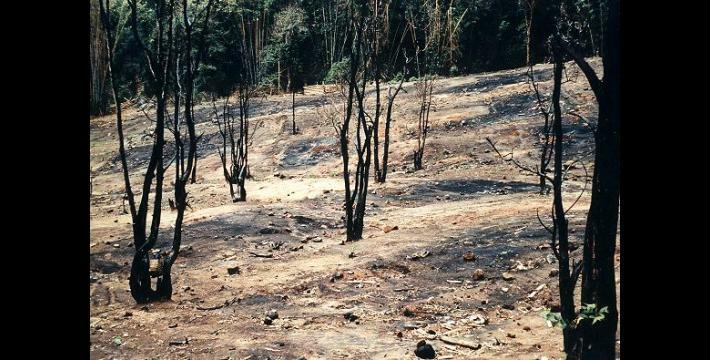 This does not include the shelters in the forest where villagers have been hiding - SLORC patrols have been specifically searching out these hiding places to burn and destroy these shelters, causing villagers to flee yet again. 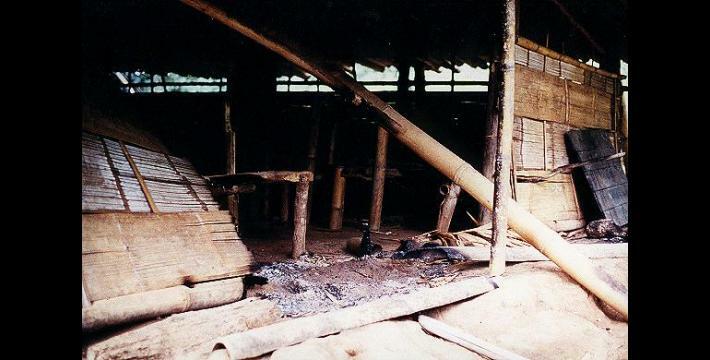 The troops specially target rice storage barns in order to wipe out the villagers’ food supplies, often bushwhacking their way to hard-to-find hiding places just to burn one or two small rice barns. 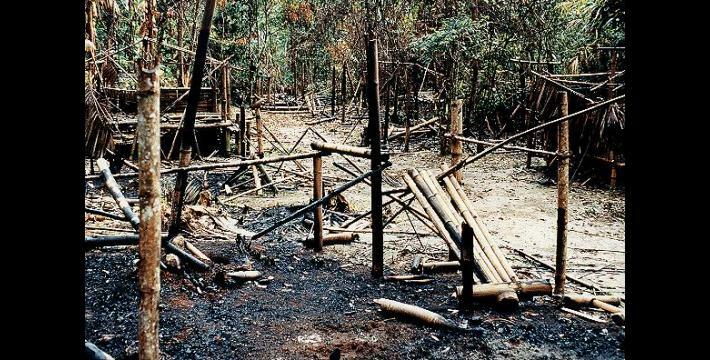 Troops are also revisiting villages they have already burned, just to look for any trace of villagers and to burn any remaining buildings or sheds which they accidentally missed the first time. Any villagers seen in the area are shot on sight. All photos in the list are attributable to KHRG and are Copyright KHRG 1997, except Photos #25-28, which are attributable as noted. Numbers in this list correspond to numbers written on the backs of the photos. Due to limited resources, some photos in the list may not be included in the set mailed. 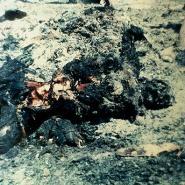 Further copies can be obtained by notifying KHRG and paying the costs involved. 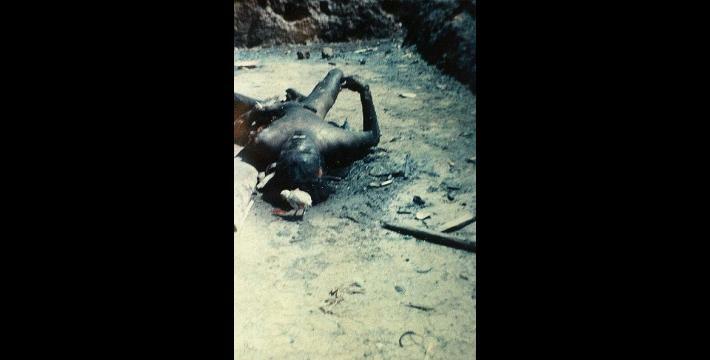 Some details have been omitted from the photo descriptions to protect the people involved. 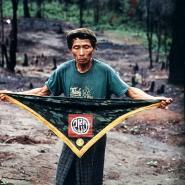 These photos may be used in any way to help the people of Burma. 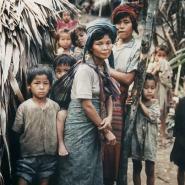 In the near future, copies of some of these photos should also be available on various Burma-related World Wide Web sites. 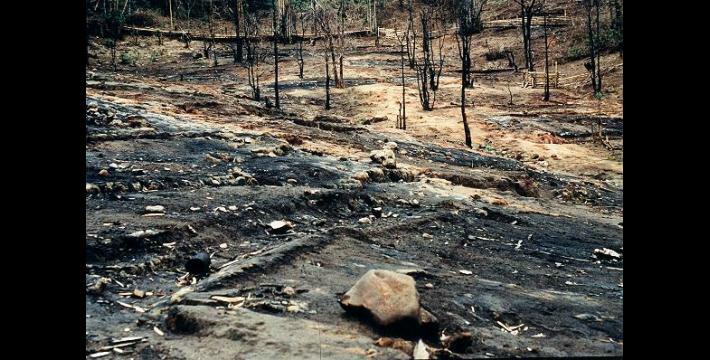 Note that in many villages all of the houses were built of bamboo, and when these are burned they look like blackened deserts where nothing remains of the houses except black squares on the ground, while in other villages many houses were built of wood, and in these charred houseposts are still standing. 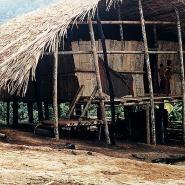 Karen houses are raised above the ground on posts and are generally quite large, housing an entire extended family. 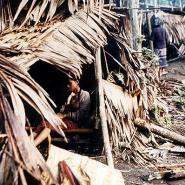 Most of the destroyed villages had 10-20 households. 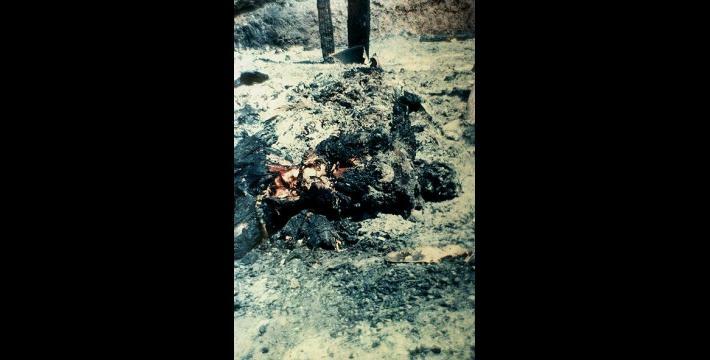 The stories related to the following photos will also be covered in an upcoming KHRG report. 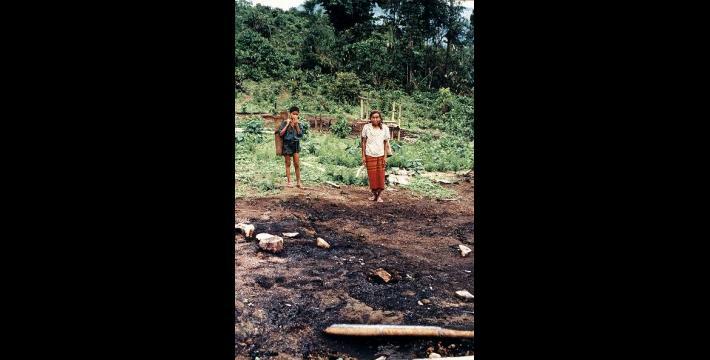 Photo #1: A Karen woman and her children stand on the remains of what used to be their house in Bpeh Day village. 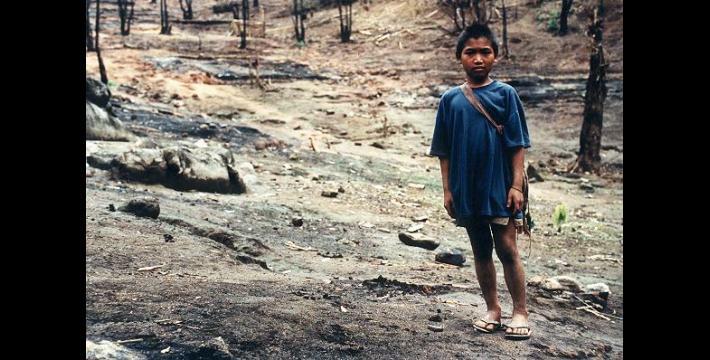 Every house in the village was burned, and they now live in the forest in hiding. 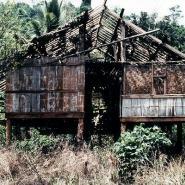 Photos #2,3,4: The ruins of Kaw Mu Bwa Der village near the Bilin River. 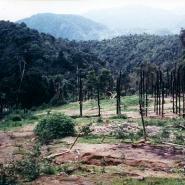 All 27 houses were completely destroyed. 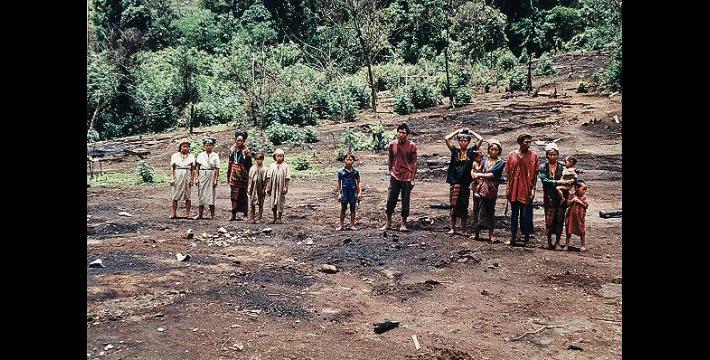 Photo #5: Villagers coming back to look at the remains of their village, Kwih Toh Kee. 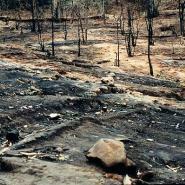 Photos #6,7: The remains of xxxx village in the hills between the Yunzalin and Bilin Rivers. SLORC troops approached the village, took up a position on an adjacent hilltop, and without warning began a mortar barrage of the village. 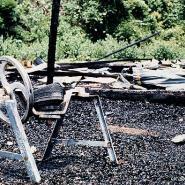 The villagers fled in all directions, after which the troops marched into the village and burned every house and shed. 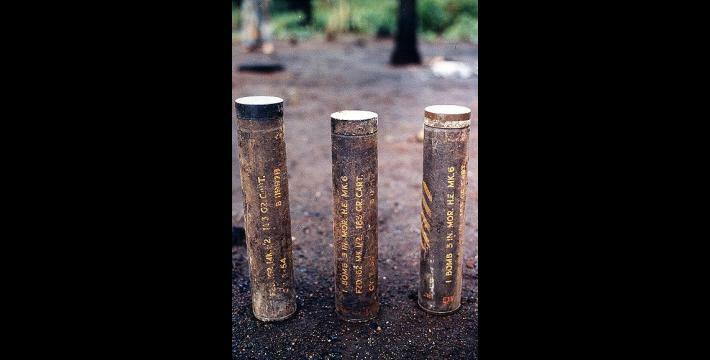 When villagers sneaked back into the village later to look, they found everything burned and 3 mortar shell containers left behind on the adjacent hill by the departing SLORC troops. 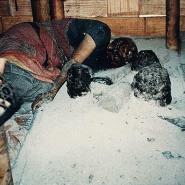 Photo #6 shows some of the villagers among the burned remains of their houses, together with the shell cases; Photo #7 shows the mortar shell cases. 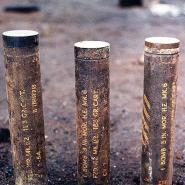 KHRG is currently having the markings investigated to find out their origins. Photo #8: The headman of xxxx village, in the hills between the Yunzalin and Bilin Rivers, stands among the burned ruins of his village where over 10 families used to live, displaying the SLORC unit scarf accidentally left behind by one of the soldiers who burned it. The scarf is marked ‘391’, for SLORC #391 Light Infantry Battalion. 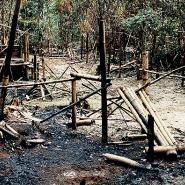 Photo #9: All that is left of Haw Kee village, which used to have 10-15 households. 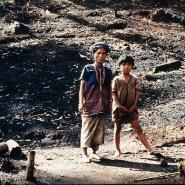 Photos #10,11: Maw Lay Kaw village near the Bilin River, where all 8 houses were burned. 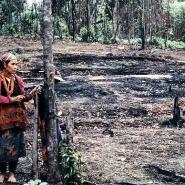 Photo #12: Villagers from xxxx village, near Yeh Mu Plaw, gather on all that remains of their houses. 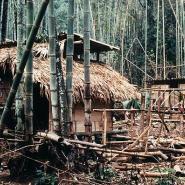 They are now living in hiding in the surrounding forests. 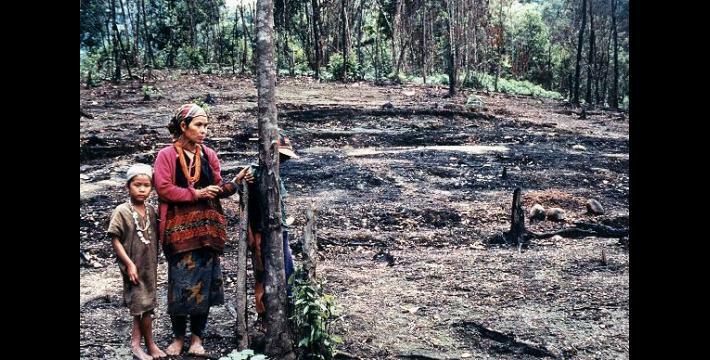 Photo #13: Karen woman and her son standing where their house used to be, Bo Kywe village. 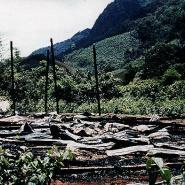 Photo #14: Remains of a large house with teak posts, Kaw Weh village. 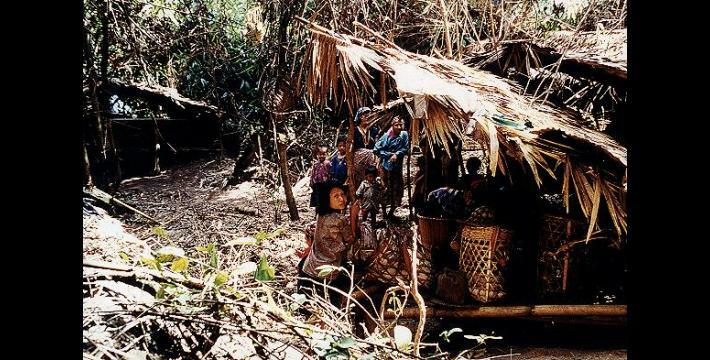 Photo #15: Villagers in hiding pass through Thay Tho Der village, looking for food in the forest and anything they can still salvage from their homes. 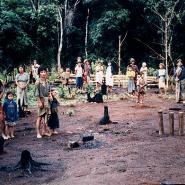 Photo #16: Villagers come out of the forest to get water at the old places, where they know the water is good. They must cross their burned village to get there. 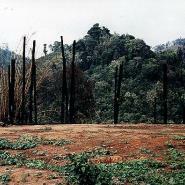 Photo #17: Lay Po Kaw Tee, a particularly beautiful and well-off village on the bank of the Bilin River, where all the houses and the church were completely burned down. 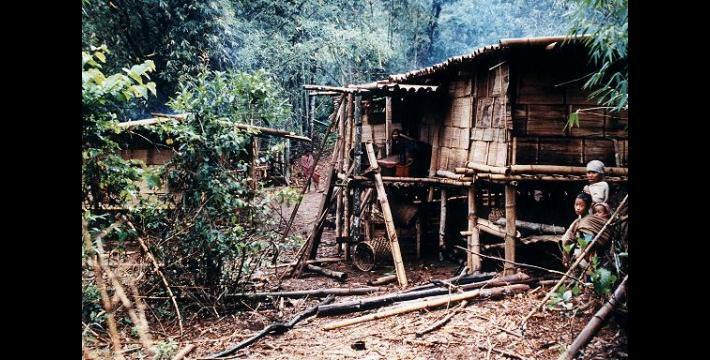 The villagers now live in lean-to’s in hiding up in the hills. Photos #20,21: Community buildings such as churches and schools are especially targetted for burning by SLORC troops, as are the nicest-looking of the houses. 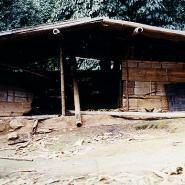 This was the primary school of xxxx village, built and run by the villagers themselves. 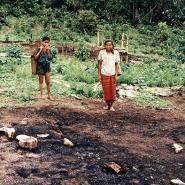 When the troops burned the houses of the village in March they missed the school. Then in June a search-and-destroy patrol passed through the village, saw the school still standing, set it on fire and moved on. 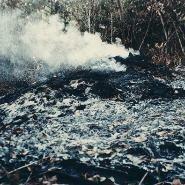 However, rainy season had begun and the building was too wet to burn properly. 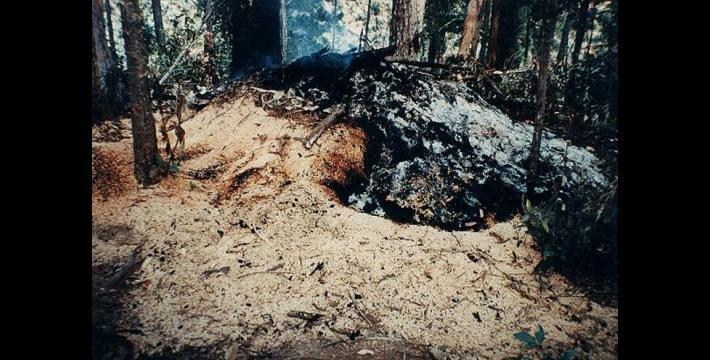 Photo #21 shows clearly where the troops tried to start the fire. 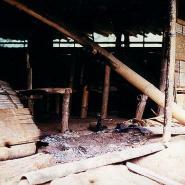 Photo #22: The SLORC troops also specifically target rice storage barns in order to wipe out the villagers’ food supplies. 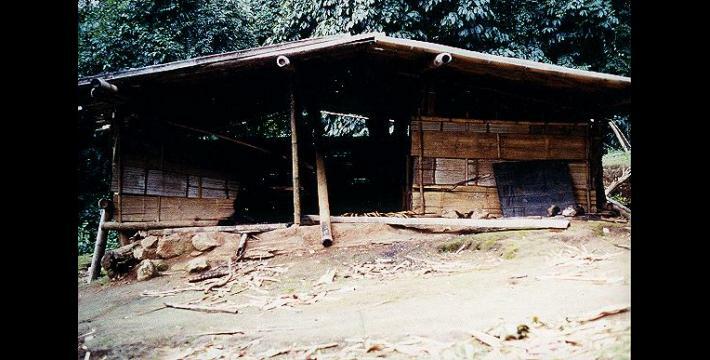 The villagers hide these small barns in difficult-to-reach spots in the forest to keep them away from SLORC troops, but the soldiers search hard for them. 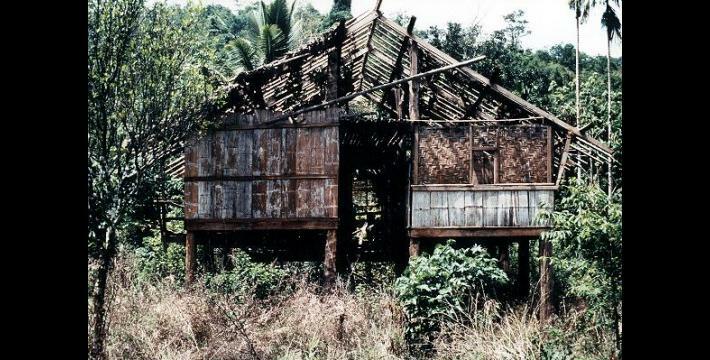 This is all that remains of a rice storage barn which was hidden in thick tangled bush on a steep hillside. 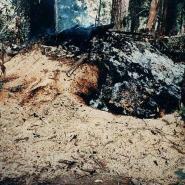 Even so, the troops found it and burned it. 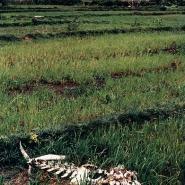 The rice in such a barn could feed a family for 4-6 months or more. 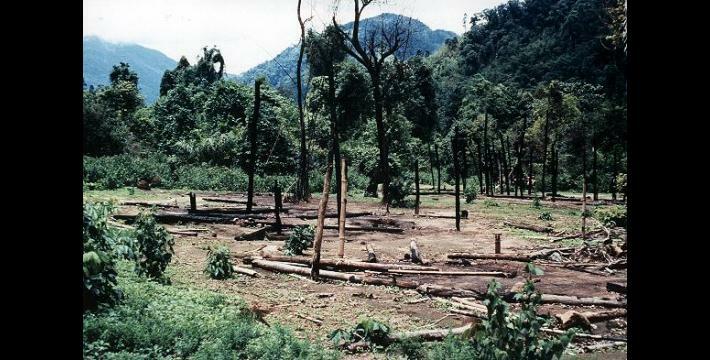 Photo #23: A village near the Salween River which was not targetted by the campaign, but it is abandoned anyway because there are SLORC troops based 1½ hours’ walk away at Kyauk Nyat. 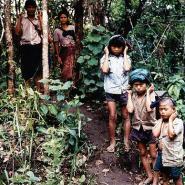 The troops regularly stormed the village to loot it and capture porters, and in December 1996 they arrested 10 villagers and threatened to kill them if a large ransom was not paid. 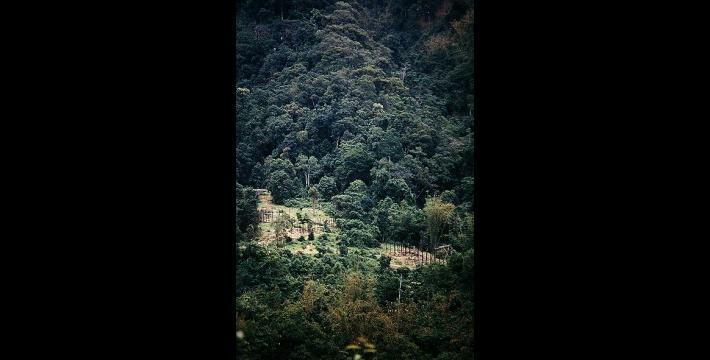 After paying the ransom, the villagers fled en masse into hiding in the hills farther from SLORC. 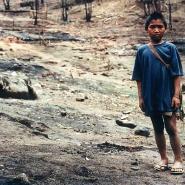 Photo #24: A 17-year-old boy whose village had been destroyed, so he fled into hiding in the bush with his family. 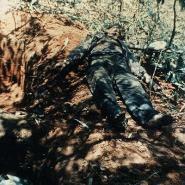 A month later he was out collecting food in the forest, was sighted by a SLORC search-and-destroy patrol and shot on sight. 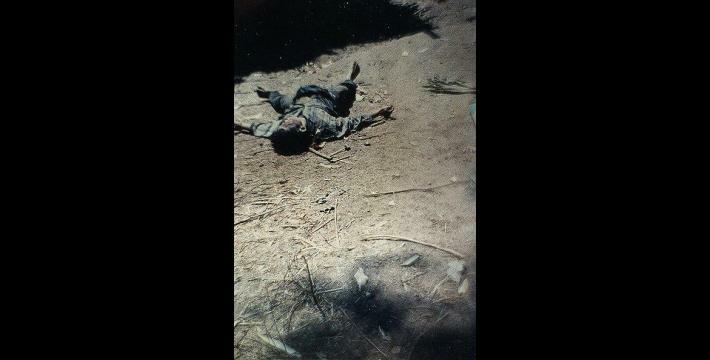 He never even saw the troops who shot him, he just heard a shot and ran as far as he could before realising he’d been shot and collapsing. 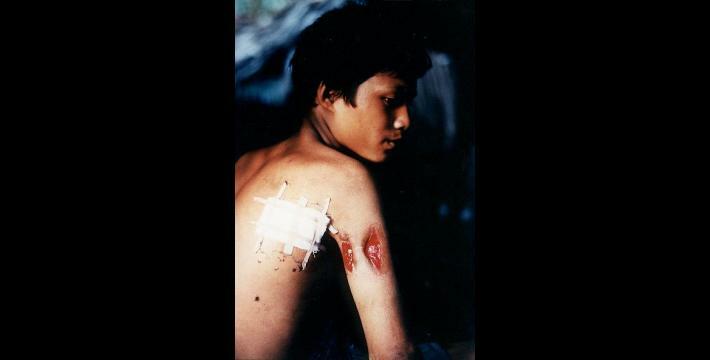 The G3 assault rifle bullet passed through his arm and lodged in the muscle of his back. 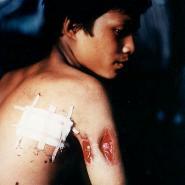 This photo was taken weeks later, when he had received treatment by a passing Karen Army medic. 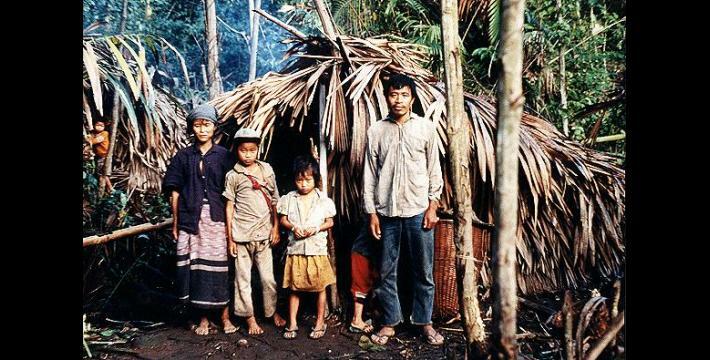 He is still living in hiding in the forest with his family. 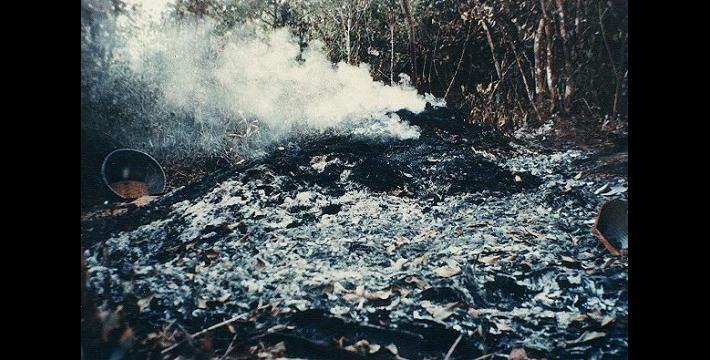 Photo #29: The remains of a buffalo shot dead and left to rot by a passing SLORC patrol near Yeh Mu Plaw. 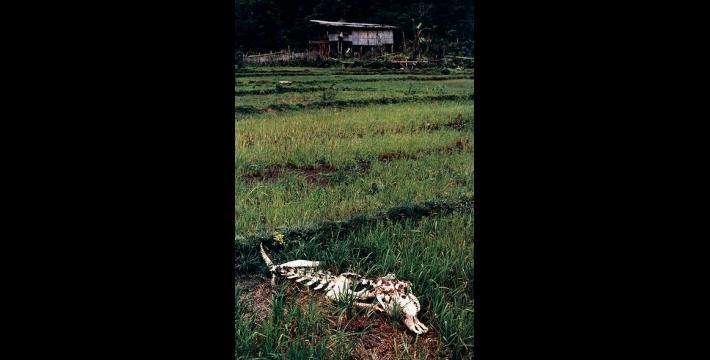 Many such skeletons can be seen in the area, as the SLORC patrols shoot anything they see moving, human or animal. 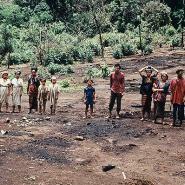 Killing buffalos is another way to wipe out the villagers’ ability to provide food for themselves. Note the farmfield hut in the background; a week before this photo was taken, in a similar hut just 20 minutes’ walk away a SLORC patrol found an elderly woman working. 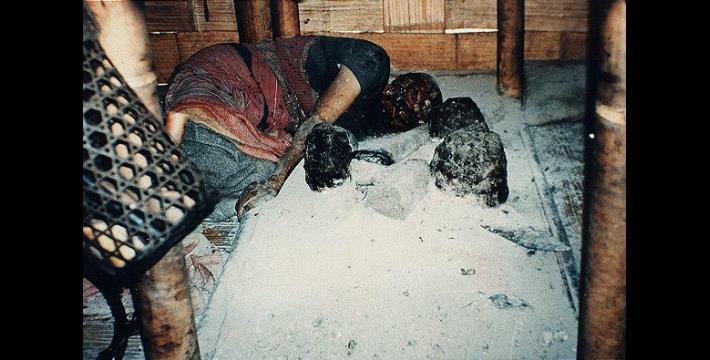 They surrounded the hut and opened fire into it without warning, killing her, then they burned the hut with her body inside it. 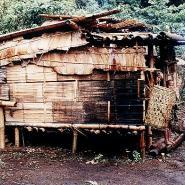 Photo #30: Villagers throughout the area must try to survive however they can; in this case, the family has built a new, simpler house right on the charred posts of their old house. 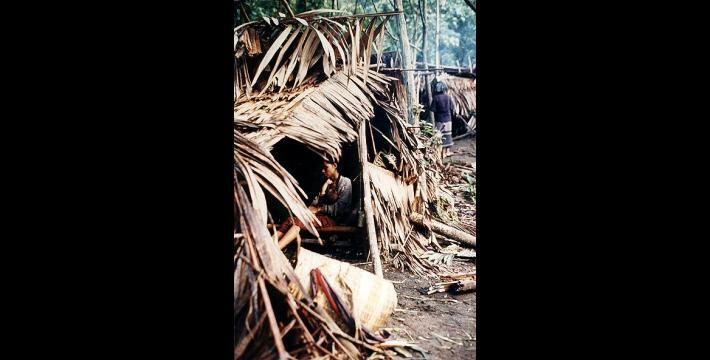 Photos 31,32,33: Shelters built in the forest by villagers in hiding. 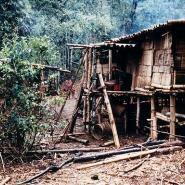 Most villagers have lost almost everything they had. 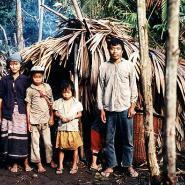 Each small shelter can have to house up to 8 or 10 people in an extended family. 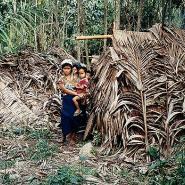 If too many families or shelters occupy the same location, they risk detection by SLORC patrols. 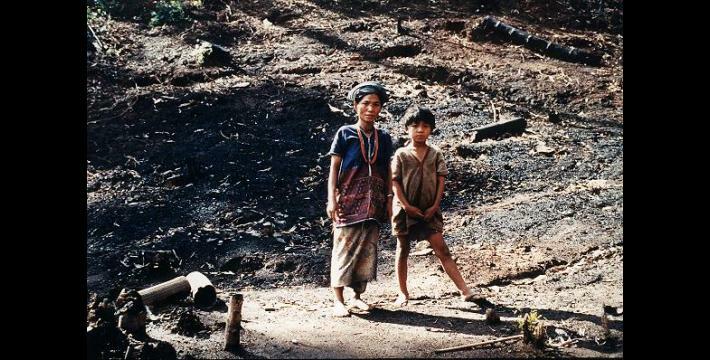 Photo #34: Villagers living in lean-to’s in the forest upstream from their burned village. 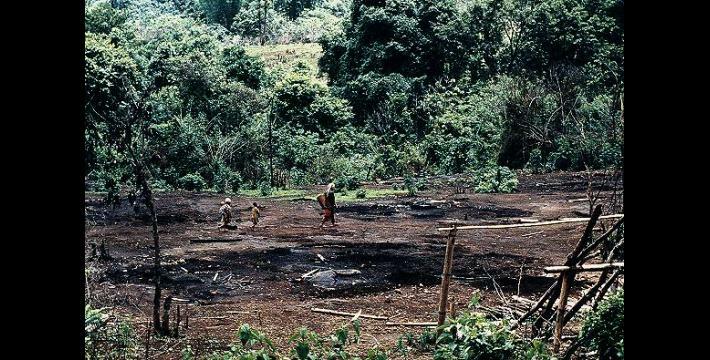 They try to stay reasonably close to their fields so that they can still grow a crop; otherwise they will face starvation. 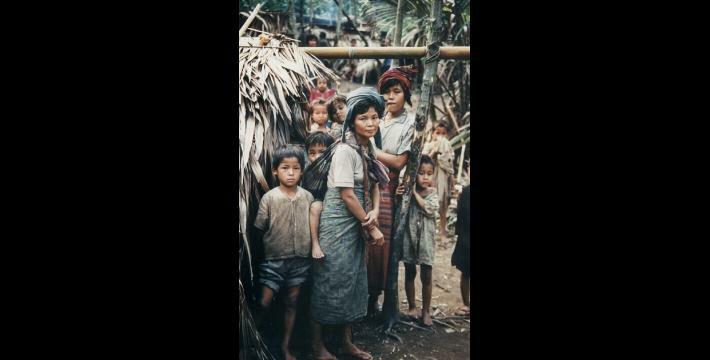 Photos #35-39: A group of villagers from several destroyed villagers who gathered in a well-hidden site, where they have been living on the ground in small leaf lean-to’s since May with very little food and no medicine except what passing Karen Army patrols can give them. Most have nothing to eat but rice and leaf soup, no salt, and not enough rice to last them until they can (hopefully) harvest a crop in November/December. 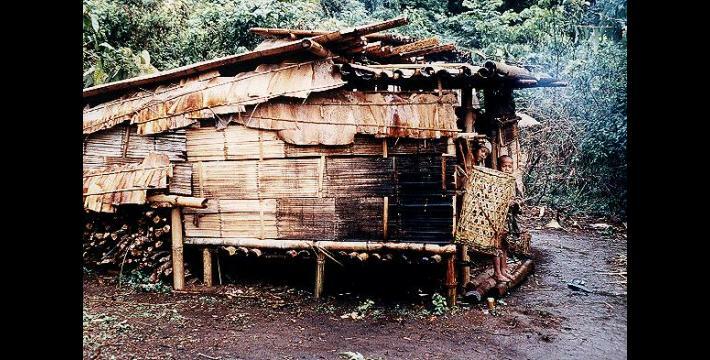 They dare not build bigger huts for fear of detection. Even as these photos were being taken, word came that a large SLORC column was passing not far away and the villagers were extremely tense and frightened. 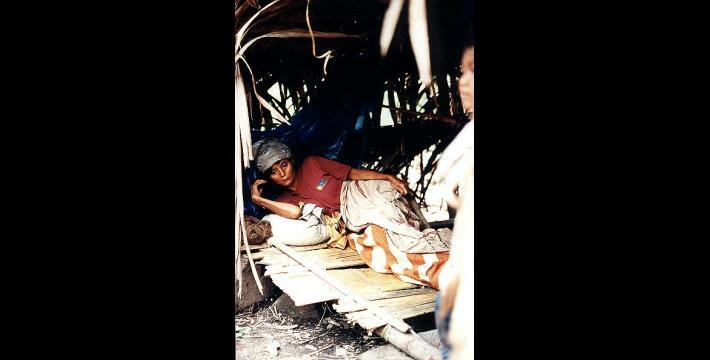 Photo #40: A woman in hiding in a forest shelter who had been down with serious dysentery for several days. She had no medicine. 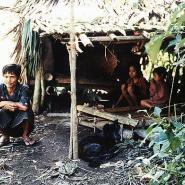 Many villagers in hiding, particularly children and the elderly, die of diarrhoea, dysentery, malaria and other treatable ailments. 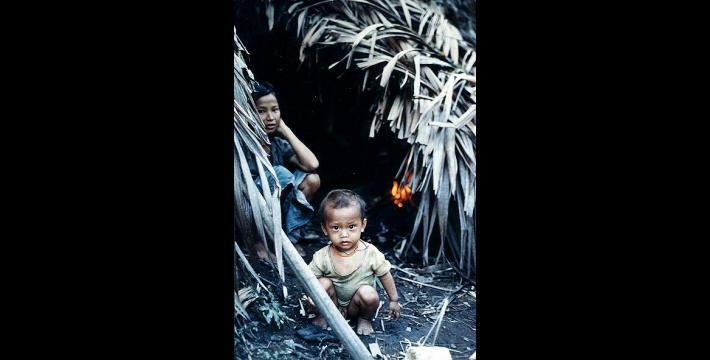 Photo #41: The children of the displaced have no chance of a school education, no proper food or medicine, and face an over 20% chance of dying before age 5. 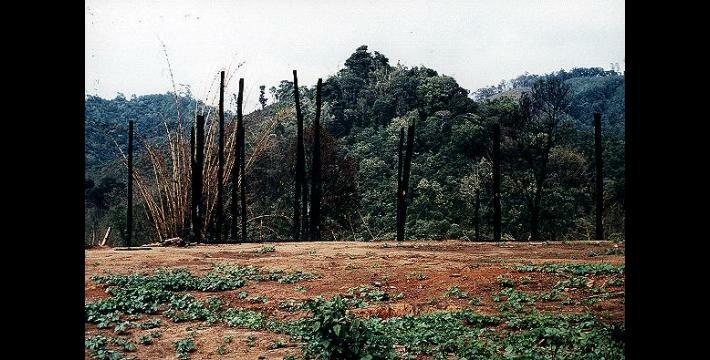 Photo #42: When Lo Plah, Dta Leh Gaw Der and Lay Po Kaw Tee villages along the Bilin River were all completely destroyed by SLORC, some of the villagers from all 3 villages fled to this patch of forest and built small shelters. 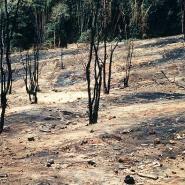 On June 6-7, a SLORC patrol found the site and immediately burned it. 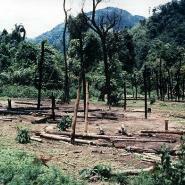 Because of the rains not all of the shelters would burn, so they ripped down whatever was left. 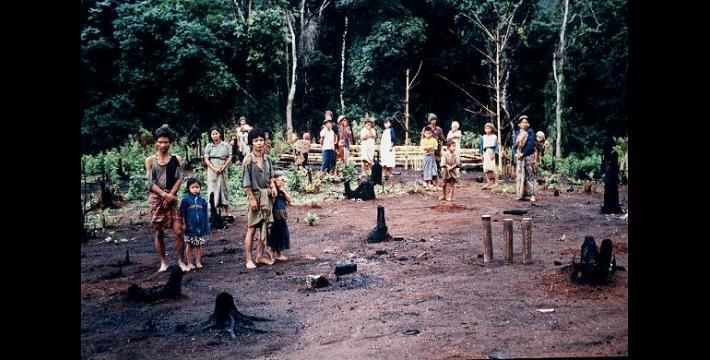 Fortunately, the villagers knew they were coming and escaped. 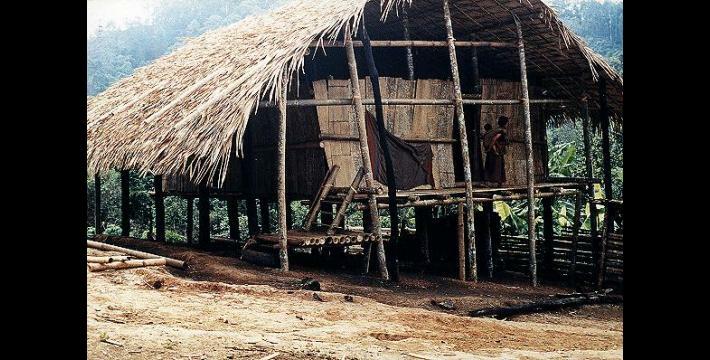 They have now scattered further into the hills to build even simpler shelters at more remote places. Photo #43: A family flees. 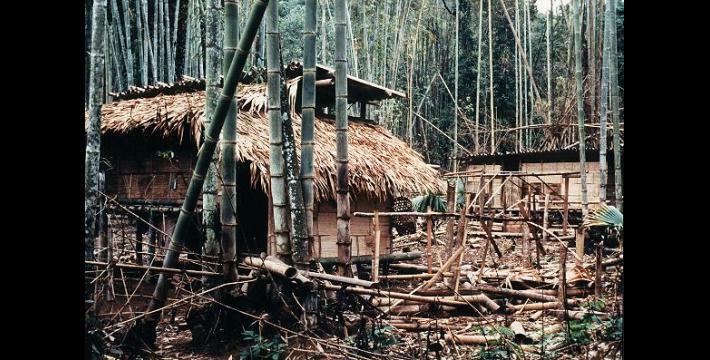 SLORC troops destroyed their village in March so they fled and build a shelter in the forest. 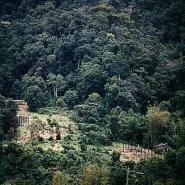 In June, a SLORC patrol was passing near their shelter so they had to flee further into the hills in fear. 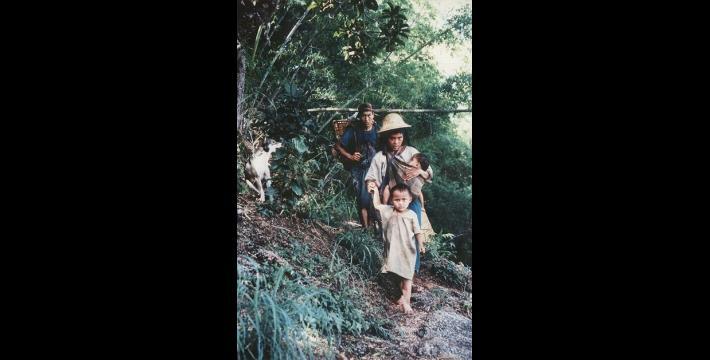 The baskets on their backs contain all that they still possess. 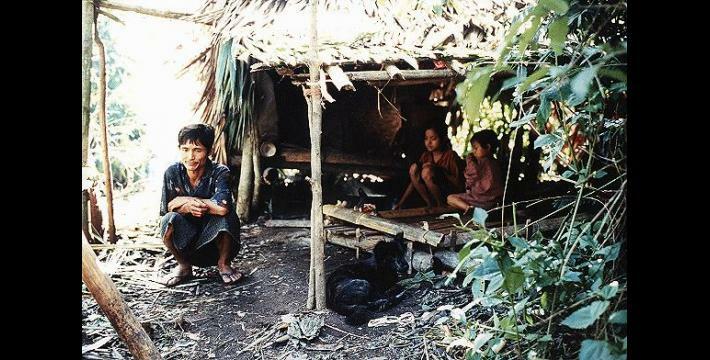 Photo #44: Villagers hiding in a farmfield hut discuss their future. 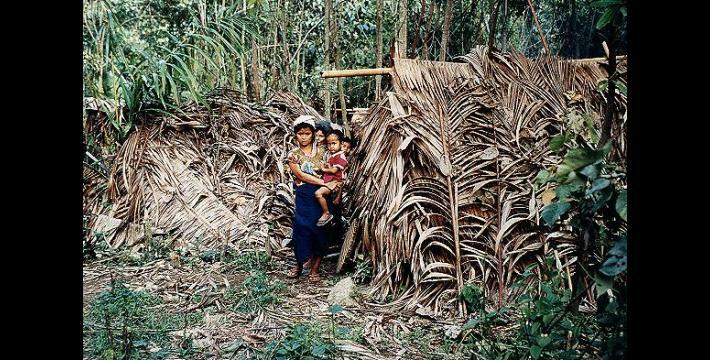 Most villagers in the region admit they have no food, little chance of a crop, and no idea how they will still be surviving 2 months from now. 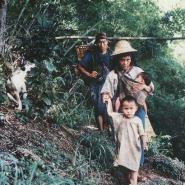 Photo #45: A family from Meh Way tries to head for Thailand, where they have never been before. 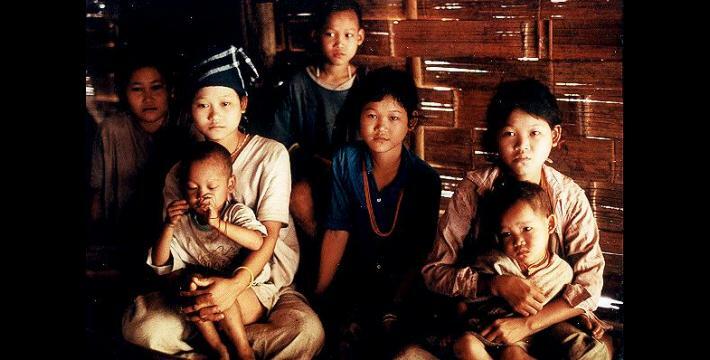 Their village was not destroyed, but the people of several other villages were forced to move there and they said that since that time the burden of forced labour and other SLORC demands and abuses has become unbearable. Then they heard SLORC troops will re-establish a permanent base in their village, so they fled. 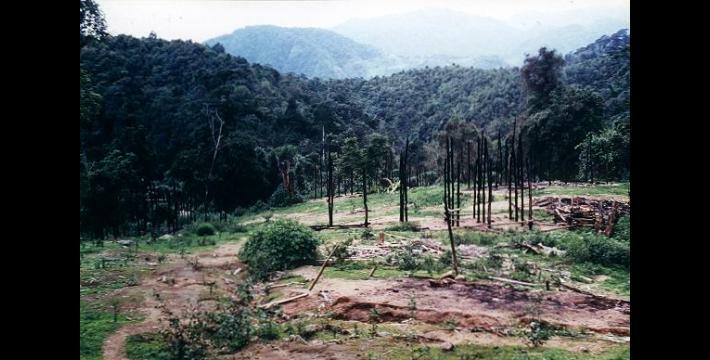 Only the most desperate head for Thailand, because many of the paths are land-mined and the trip involves dodging SLORC patrols and passing within 10 minutes’ walk of at least two SLORC Army camps. 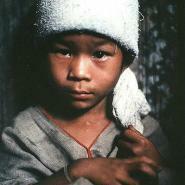 Photo #46: Part of a family of 9 orphans, the eldest being 21 or 22. 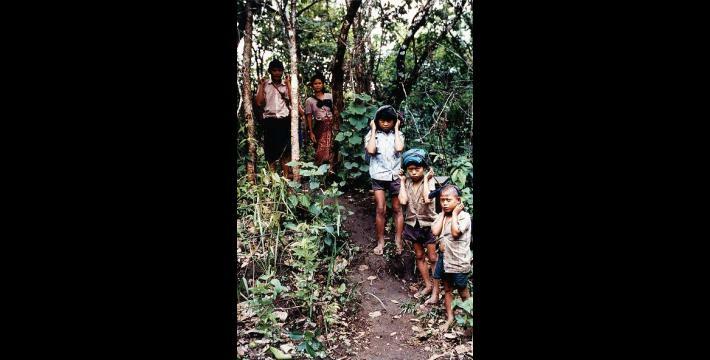 In early 1997 their mother hanged herself because she couldn’t bear life in the area anymore. 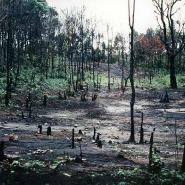 Then their village was burned and destroyed by SLORC troops so they fled into hiding in the forest, where their father fell ill and died. 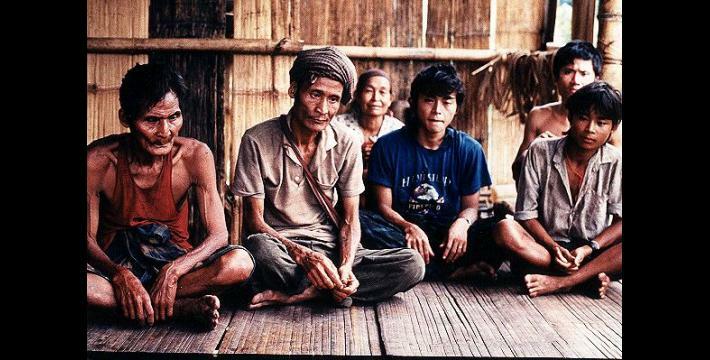 With no food and no way to support themselves, they were helped to the Thai border by Karen soldiers, and they are now refugees in Thailand. The two girls on the right are 15-year-old twins. 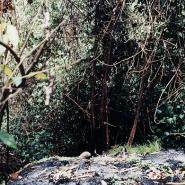 Photo #47: Child inside a shelter, in hiding in the forest near the Bilin River. 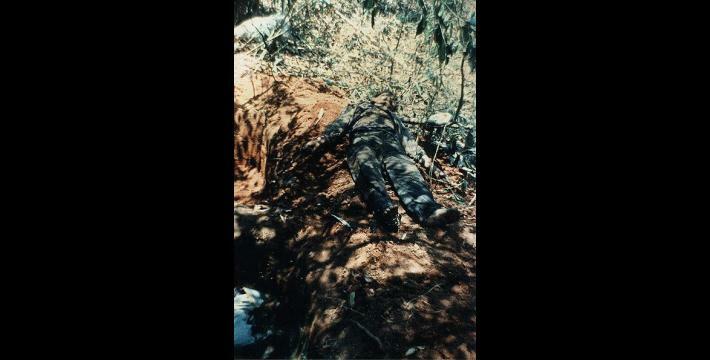 Photo #52: Two former SLORC soldiers who quit the Army in disgust. 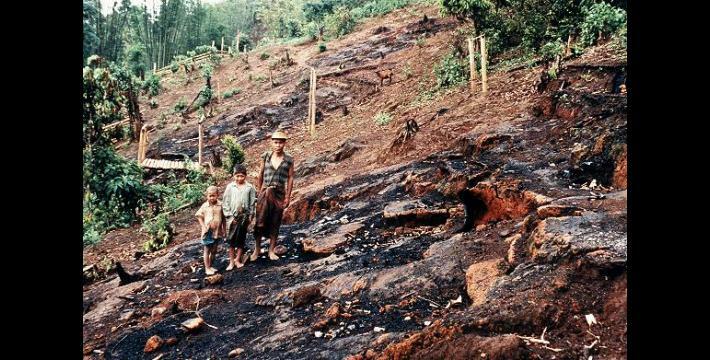 The soldier on the left served for 19 years and had the rank of Lance Corporal, but his salary in 1996 was still only 1,100 Kyats [US$5 at 1996 market rates] per month, out of which he had to buy his own uniforms and some of his equipment. 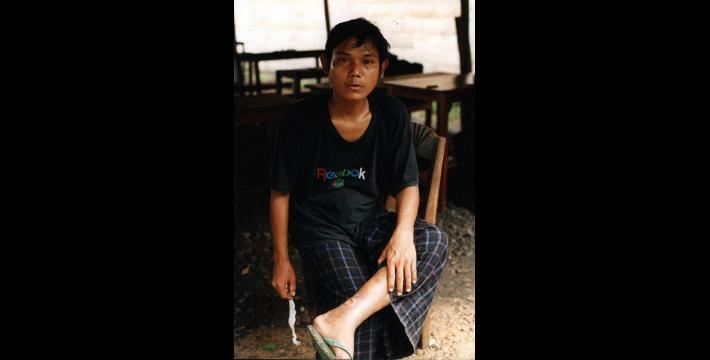 He lost his leg in combat in 1989, was paid 30,000 Kyat ‘compensation’ and given a prosthetis, but when it wore out 3 years later the Army would not replace it unless he paid extensive bribes. As a result, he served as an active soldier from 1991-1996 on crutches with no prosthesis (mostly guarding porters being detained at the Army camp). 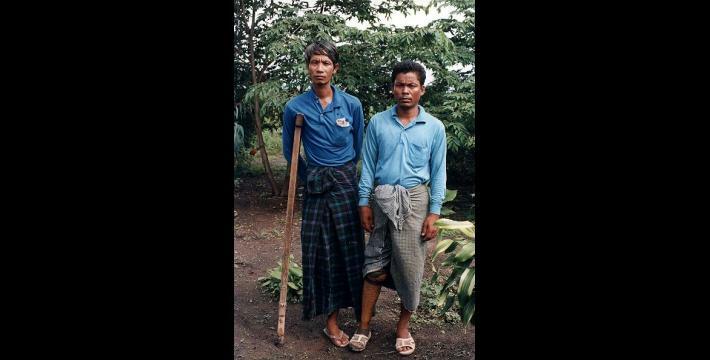 The soldier on the right had a similar story - over 12 years’ service and a leg lost in 1987. He also could not get a new leg, but had somehow managed to keep repairing his original one with nails and bits of wood and wire until he quit the Army in 1997. 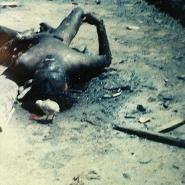 They said that normally soldiers are forced to bring in 5 new recruits before they are allowed to quit, no matter how long they have served (this results in soldiers prowling the markets trying to coerce impressionable 12-14 year old boys into the Army); however, they were exempted from this because they had lost limbs. 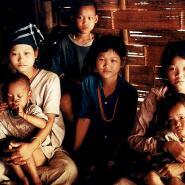 For their long service they now receive a pension: 510 Kyats [US$2 at current market rate] per month. 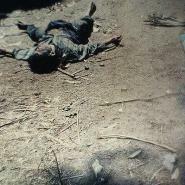 Photo #53: A trishaw driver from a town north of Rangoon who was rounded up with all the men at a video cinema and taken halfway across Burma to be a porter for SLORC troops in Karen State. 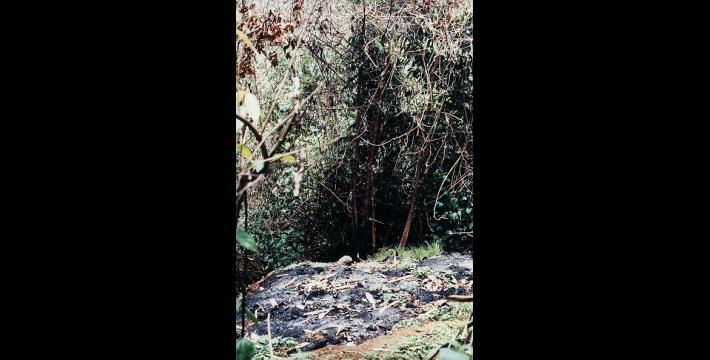 He was wounded in the ankle by tripping on some sharp bamboo with his heavy load, and eventually couldn’t walk any more so he was left behind in the forest with nothing. 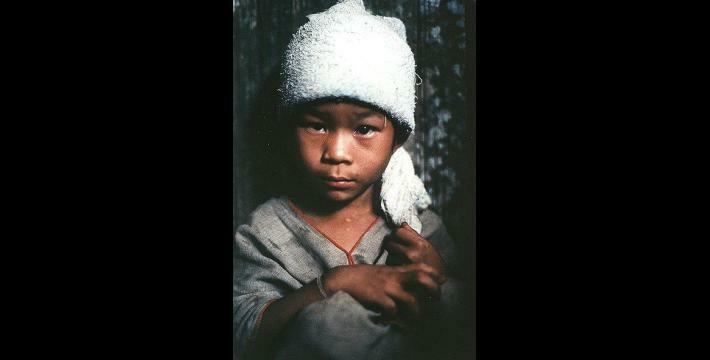 He managed to make his way to a village where people helped him, but he now has no way to get back home. His family has no idea where he is.